In My Humble Opinion: Tyler Perry taking over the character that was made famous by Morgan Freeman in a “prequelesque” movie has got to be some of the worst casting I have ever heard of. Now to be fair, I don’t watch much Tyler Perry stuff anyway haha. However, I know there are plenty of other black actors that have the talent needed in order to pull this role off, I just don’t see Mr. Perry being one of them. I’ll admit some aspects of the movie got me pretty excited when I first saw the preview. Matthew Fox looks like he fills the role of “crazy” pretty well, not to mention he seems to have transformed his body more than DeNiro did for Cape Fear. Tyler Perry on the other hand, I don’t know, I just can’t buy him as a police detective / psychologist. Morgan Freeman did a good job in the first two Alex Cross movies; Kiss the Girls and Along Came a Spider. They weren’t blockbusters or great by any means, but they were still decent films that were entertaining in their own right. If the studio wanted to bring Alex Cross back to his beginnings and cast a younger actor surely they had some other people in mind right? In my reading, Idris Elba was first approached to take over the role and frankly, I think he would have killed it…in a good way. Idris Elba is slowly becoming one of the premier actors in Hollywood, mark my words people. Another two names I would like to throw out there are Harold Perrineau and Lennie James. I know I know, Harold Perrineau and Matthew Fox played together on Lost and it might have thrown off the balance of the movie, but I think Harold is a great actor and I am loving him as Damon Pope on Sons of Anarchy. The other actor I mentioned Lennie James not only looks like a younger Morgan Freeman, but can carry deliver just as good a performance. You might remember him from Jericho, where he broke out as a CIA operative that you weren’t sure you should root for or against, which was part of his genius. 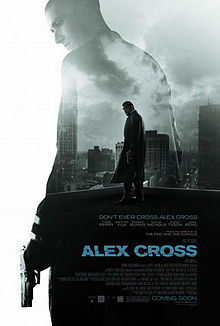 Unfortunately none of these actors got the role and it fell to Mr. Perry to fill the shoes of Alex Cross. I just hope that the studio didn’t do this in an attempt to capitalize on his sudden rise to fame…oh who am I kidding of course it did.